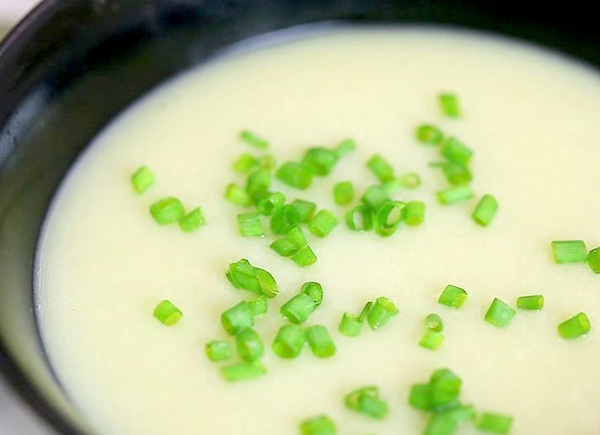 Commonly called cold potato soup, this recipe is delicious, a little sophisticated, and an easy dish to make! Serves 10 people. In a heavy Dutch oven or deep pan, melt the butter. Add the leeks and soften them, but do not brown. Add the broth and the potatoes and cook for 20 minutes. Cool slightly and with an emersion blender, puree the soup until silky. You can also put small batches of the cooked soup in a blender to puree. Add the cream and and salt and pepper to your taste. Cool in the fridge. Pour into chilled bowls, add a splash of cream and the chives. “May the best day of your past be the worst day of your future.” —Irish saying.